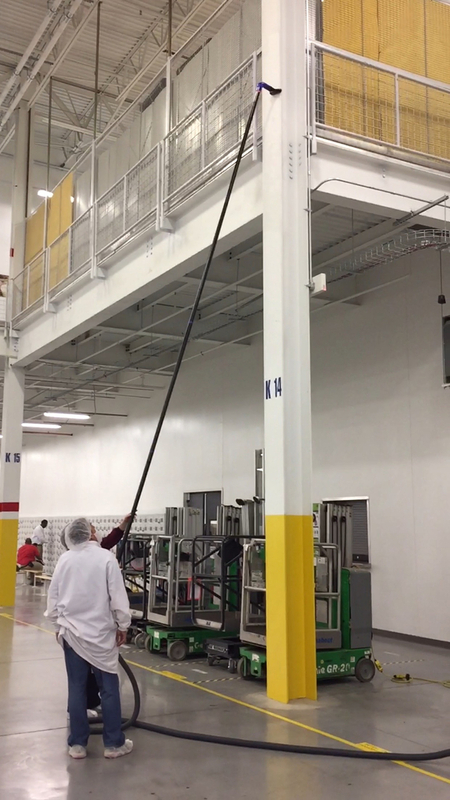 This allows the operator to clean above the ground safely, solving the worry of possible disasters when cleaning in explosive or combustible atmospheres containing airborne dust. The range said to eliminate all risks of explosion, danger to fellow workers or damage to buildings. This is achieved by preventing any source of ignition of combustible dust either by sparks from the vacuum motor or by static discharge. Spinaclean will be exhibiting at Facilities Management 2017. This year the company will introduce its brand new independently certified ATEX (Atmospheres Explosive) range of high level cleaning, specially designed for combustible areas. Based on its world famous SkyVac system, Spinaclean has utilised its extensive experience to develop the only independently certified ATEX high-level cleaning product for operation in enclosed identified ATEX zones. Spinaclean's certifier Element exists to ensure that the materials and products used are in some of the world’s most advanced industrial sectors are always safe, of marketable quality, compliant to all relevant industry standards and most of all are fit for purpose in their end application. Reaching over 40ft from the ground with one operative, the SkyVac ATEX provides a safer and cleaner environment; significantly reducing the costs of high-level access equipment as well as training. The original SkyVac, the world’s most power freestanding gutter-cleaning machine, is the leading selling product of its kind and is 30% more powerful than its nearest rival. Unlike other gutter cleaning machines in the market place, SkyVac is not an off the shelf wet and dry vacuum. The purpose built gutter-cleaning machine has unique built-in features including the slide glide entry point, making it a blockage free entry. In addition, to harness the power there is a ‘powermix’ leaver for heavy lifting or select rapid airflow for removing light objects such as leaves. The unique Slipstream Pro- Pressure washer range is another superb example of Spinaclean’ s continuing efforts to provide to customers the most practical, powerful and effectual choice of equipment. The company has expanded this range by introducing the brand new 18 litres per minute GX 390 Honda Powered Pro 20X. The Pro 20X package together with the Spinaclean 22inch (Triple Arm) Surface cleaner and variable lance really does offer exceptional value for money. Spinaclean is renowned and respected as one of the most innovative and pioneering businesses within the International cleaning industry. Its reputation has not only been built on the quality of its groundbreaking products but also on its unparalleled customer care and after sales service. In January 2017, the company moved to brand-new premises – a state-of-the-art new headquarters in Brackmills, Northampton to cater for an ever-growing customer base. Spinaclean is looking forward to continuing its great relationships with its customers and with only weeks to go until the show, the company's staff has kicked into full gear. The dedicated team including Paul Crosbie and Steve Whiting are committed to making providing expert advice and top-class customer service on the day. To visit, go to stand F230.